Before I start of my weekly entry, I have to apologise to Dimitar Berbatov for not putting one up last week. I’m sure he’ll feel really bad that his 5 goal haul against Blackburn wasn’t mentioned on the illustrious blog that is Fever Pitch. The reason I didn’t update last week was because I thought I would do it after the Carling Cup ties and after the mauling United took at West Ham, I think I was just too depressed. Arsenal are now clear favourites to go on and win the Carling Cup and just as I predicted are on course to win a trophy, unless they really screw up like United did. On to this week’s action though.. I am, of course, joking. There was no game at Blackpool because their ground was frozen and they do not have under soil heating. I had read reports about this early in the week, last week and I was hoping they’d thaw it out in time. I think its ridiculous that Blackpool do not have under soil heating and and since they don’t, United should be given 3 points and consider the game a walkover. This is just my two cents of course, Ian Holloway will tell you something else. Arsenal were playing at a place they’re not very comfortable playing at against Fulham this weekend. Most Arsenal fans were worried since the game was at the Emirates. Eventually the match was settled by two super strikers by Samir Nasri who showed such fantastic composure that you would be forgiven for thinking that he was an out and out striker. Arsenal started off really well and created chance after chance after chance but failed to put them away until Samir Nasri’s strike gave them the lead. Fulham shockingly equalized very quickly after Kamara found himself onside and one on one with the keeper. It was quite amazing, both center backs just switched off and the score was 1-1. Arsenal looked like they might throw away a lead at home again. Arsenal, however, managed to grind out a win, something they haven’t been able to do in previous seasons. Winning matches like this keep you in contention for the title. Van Persie played a gentle ball to an oncoming Samir Nasri who danced past the defence and maybe should have taken a shot, but then he made space for himself after luring out Mark Schwarzer but kept his cool and finished from a really tight angle. Any football fan should definitely watch the two goals. That win propelled Arsenal to the top of the table since United didn’t play this weekend and now next weekend when Arsenal take on Man United at Old Trafford its a 1st versus 2nd clash like back in the good old days. Another title contender and current Premier League champions only managed to pull of a draw at home against Everton. The last ten minutes or so of that game felt like they were playing at Goodison. Its rare that you see Chelsea on the back foot at Stamford Bridge, unless you saw the Sunderland game, that is, but here they were getting pushed back and back by Everton’s attack. Drogba put Chelsea in front through a penalty after Howard brought down Anelka in the box. Jermaine Beckford equalized for the Toffees and Everton earned a very good point at Stamford Bridge, but that makes it their 6th game without a win. In Italy, current European champions and league holders Inter Milan slipped to 6th place after losing to Lazio. Lazio are now in second place and AC Milan are top courtesy of a crushing victory over Brescia. 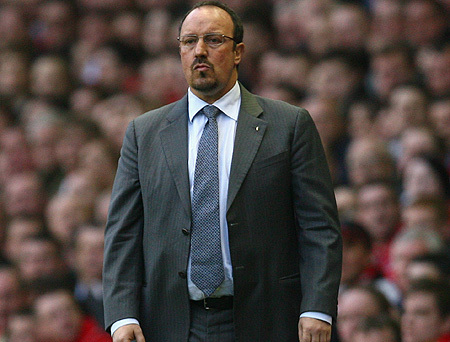 Rafael Benitez has managed to screw things up at Inter Milan so lets all give him a big round of applause and a pat on his back. All I hope now is that he becomes the next Barcelona manager. What about the Clasico piece you ask? Well, what’s there to write about? Madrid got hammered and humiliated and Jose Mourinho claimed otherwise. Who is he kidding? It definitely was a humiliating event. If that isn’t humiliating, I don’t know what is. But they managed to brush off their defeat to the Catalans and overcame Valencia thanks to a brace from Cristiano Ronaldo. However, Barcelona too won their match against Osasuna 3-0 courtesy of a brace from Lionel Messi and one from Pedro. And to finally round off things.. Reigning Champions aren’t doing too well anywhere except in Spain. In Germany, Bayern Munich suffered another defeat and are in 7th place with 23 points. Leaders Borussia Dortmund are on 40 points, a good 17 points clear. So one good season and thats it? We pulled out our prediction hats and we’re going to tell you who we think will qualify from the group stages of the Champions League. Its a little difficult to say who will go beyond that because the draws for the knock out stages aren’t done like in the World Cup. This is not in any order. We’re not predicting who’ll finish top of their group or anything. These are the teams we think who will make it out of their groups. And also the final is to be played at Wembley in May.